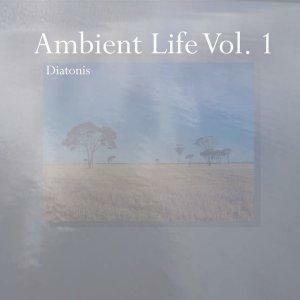 Diatonis - "Ambient Life Vol.1"
Truth in advertising here - the title pretty much puts you in the proper frame of expectations, and the innards do not disappoint. Apparently Diatonis (aka Stuart White) has been recording since the 80's and has an extensive discography, but this is my first exposure so I really can't place this in the overall body of work. It is melodic dronescape music, composed on a number of different instruments, including guitar, keys (piano and electronic), winds (flute and trumpet) and field recordings. Upon close inspection most of the tracks are densely layered and really well thought out and composed, and each track actually does shift and develop over it's course, which puts this release in a different class than a lot of contemporary drone music. "Structure of Ambient Life" opens the CD, and prominently features the electric guitar, with echoey plucked notes hovering over a dense background of keyboard- based drones. This is a common Modus Operandi throughout, although the subtle variations of each track are what keeps it interesting over the course of 70 minutes. "Shimmering Butterflies" has a more flowing guitar part, and is more than a little reminiscent of the fantastic solo work of New Zealander Roy Montgomery, while "Winding Roads" features field recordings of bird songs in the background. The melodic nature of this CD would probably make some label it with the dreaded New Age tag, and if so then so be it, but I think this deserves better. Fans of contemporary drone outfits such as Stars of the Lid, Troum, and the like should give Mr. White an hour or so of their time. I don't think they will be disappointed.